Created by Chef Aarón Sánchez of Paloma and Johnny Sánchez. More recipes by Aarón Sánchez: Albóndigas Sliders with Jalapeño Aioli & Super Grilled Shrimp with Habanero Butter. Prepare the Tacos: Preheat the oven to 325°F. Lightly toast the chiles in a dry, heavy skillet over medium heat for 30 seconds on each side, just until they become fragrant, but not blackened. Transfer to a plate and set aside. Season beef with salt and cacao powder. Heat oil in a Dutch oven, or other heavy pot with a lid, over medium-high heat. Once the oil is hot, add meat and sear for approximately 3 minutes on each side, working in batches to avoid crowding if necessary, until the pieces have formed a uniformly brown crust. Add more oil to the pot, as needed, to prevent burning. As the pieces are ready, set aside on a plate. Reduce the heat to medium. Using the same pot, add the onion, celery and carrots and cook for approximately 5 minutes. Add the garlic and cook for 2 minutes, then add the tomato paste and cook for another 2 minutes. Pour in the wine and stock to deglaze the pan, making sure to scrape any bits off the bottom of the pan. Add the toasted chiles and turn the heat to low. Simmer uncovered, stirring occasionally, for approximately 5 minutes, until the chiles have softened and are pliable. Add the cumin, pepper, oregano and TABASCO® Sauce. Return the meat to the pot and cover. Transfer to the oven and cook for approximately 3-4 hours, stirring occasionally. Prepare the Coleslaw: Heat the mezcal in a sauté pan on medium heat until it flames (be careful because the flame can get pretty high!) and the alcohol burns off. Once the flame dies down, add the sugar and heat until dissolved. Add the lime and orange juices; bring to a boil and reduce by half. Remove from heat and let it cool. Note: If you are using orange liqueur, combine all liquid ingredients and sugar and reduce by half, then follow the remaining steps. In a large bowl, combine juice mixture with apple cider vinegar and cilantro, then toss in coleslaw mix and season with salt and pepper to taste. Set aside. 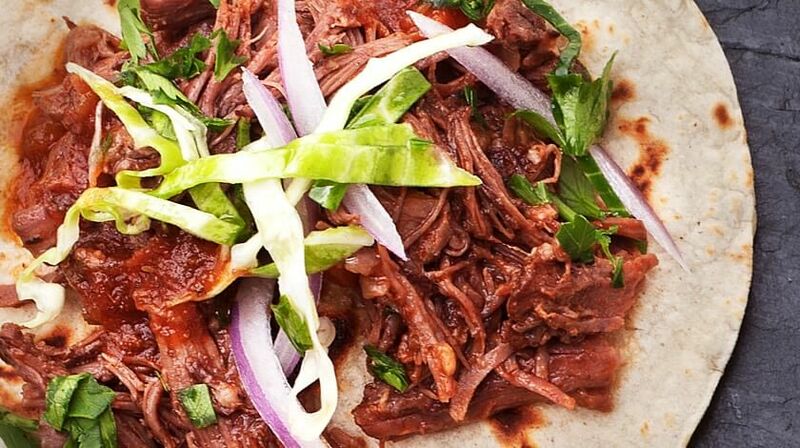 To assemble tacos, remove meat from sauce with tongs. Using the tongs or forks, shred the meat. Strain the sauce, and once the meat has been shredded, incorporate some of the sauce back into the meat. Taste and add salt, if necessary. Build tacos, adding the meat first and then coleslaw. Finish with chopped onions and cilantro. Serve with lime wedge.